Select the files (or folders) you want to copy in either Explore or File Set view, press F7, click the copy command button or select the Actions > Copy To... menu item and the above dialog will appear. Select the destination and press OK. The list of previous destinations is kept so that files can be copied quickly and easily. 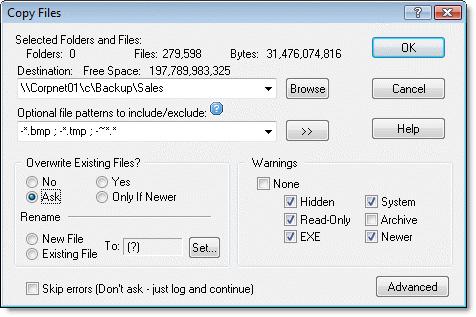 Click the Advanced button in the lower-right corner of the dialog and it will expand to display more options giving full control over how files are copied.